I've been wanting to go a Modern Quilt Guild meeting for what feels like forever. There are two chapters that are each about an hour away from me. Last weekend, FINALLY, I had the time on a Saturday when the SCTMQG (Southern CT Modern Quilt Guild) were holding their monthly meeting. I met a great group of ladies (all ladies, does your MQG have men?) and already have the February meeting time blocked off on my calendar. 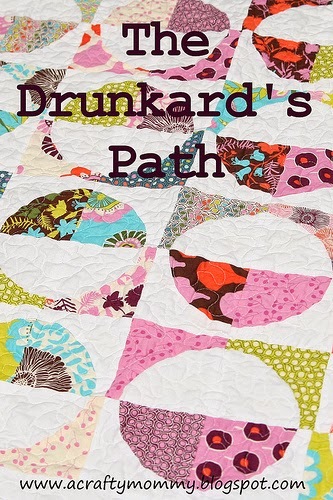 I'm really looking forward to some of the programming that's scheduled for this year, but more importantly the motivation to stretch out and try new things...like this month's challenge...the Drunkard's Path. I was so excited at the meeting that I forgot to trace the templates they had. So I found one and tried to make my own thin plastic template. This was my first try at ANY curved piecing. You can see that my square parts are too narrow and my circle parts are different sizes. It's a miracle I passed kindergarten, because clearly I can't trace worth a damn, and my trimming is WAY off. Still, I loved how fun it was. Someone at the meeting had copies of the paper that had come with their template, so I went right online and bought a set from Baycreek Quilting Products (www.quilttemplates.com). They arrived in exactly a week, they are nice and thick and as you can see, the proportions are right. Once I had the templates I dove right into my second attempt, with some precious Cotton + Steel fat quarters that I bought for something just so special. TAAADAAA! Cotton + Steel - using 5" templates - VOILA! I'm not sure if it was the sturdiness of the templates, that I had some practice with the first set, or what else, but as you can see, this block turned out MUCH better. And much more precisely lined up. Once I got going, I had to try a second one, and I used some of the scraps left over from my most recent finish, my Darling Quilt by Freckled Whimsy, my precious Heather Ross Briar Rose leftovers. What's the quilting technique that intimidates you most?